CNC Vertical Turning Lathe Series deliver high speed and high precision machining to meet the needs of today s sahil alloys and machines. Three-axis vertical turning to an indexing table and a live spindle, this model can do milling, tapping and other various machining jobs. There are two-speed gear box is delineating to intercept the gear-wheels noise and the gear vibrations, ensuring precision machining quality. Minimal Turning Noise Two-stop high and low speed table drive offers high torque for heavy duty machining even at low table speed. High Torque Table Drive High precision cylindrical roller earnings and thrust bearings ensure heavy charge and high precision. Substantial Duty Construction Rotary encoder coupled with indexing gear and backlash compensation device offers precision 0.001 table indexing for C-axis. Hydraulic 3-jaw chuck is an optional item. If the hydraulic chuck is ordered with a machine, the standard 4-jaw manual independent chuck will not be providing with the machine. The bottom of double column is fixed on both floor and the table base, and the top is fixed against the top beam. . The box-type base and column make a highly honourable highly firm structure and the headstock with portal construction that minimizes the consequence of thermal deformation and vibration ensuring stable accurate cutting. The chief spindle with the work piece carries out all necessary movements in the machine axes. Tool holder clamping mechanism of the VTC series is the pull-stud bolt type. To accept both turning and milling tools, the Ram is designed to hold ISO spindle taper. The machine can accomplished its machining process after a single setup, which can save your time and cost. Suraj Foundry was established in the year 1960. 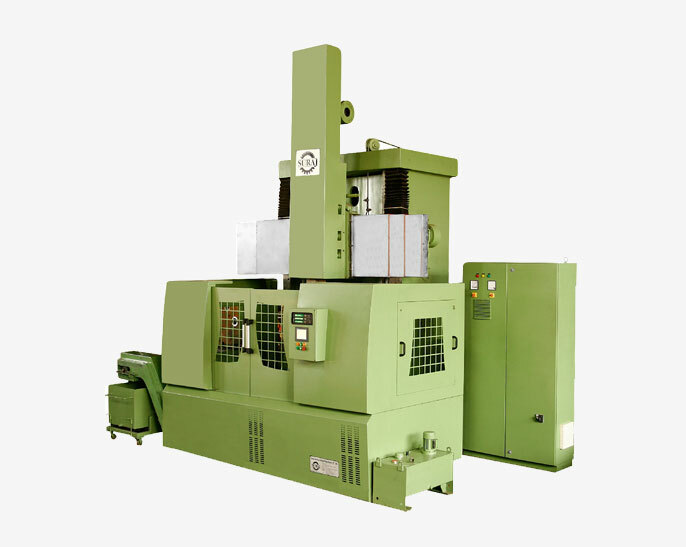 After reaching landmark of being only known for their graded casting, are today virtually known to produce high grade, medium/large heavy duty Lathes, Facing Lathes, Boring Machines, Planers, Plano-OMiller and SPM’s. Besides, using inputs materials, we follow strict Quality Control Methods, such as stress relieving, ultra sonic testing, metallurgical balances, proper hardening of gears to name a few.